Nationwide, the jobs picture wouldn’t look as good if it weren’t for the energy industry. Take out the 1.1 million jobs created in Texas, the state that has led in job creation, and the country would be 350,000 below the 2008 peak, according to research by the Federal Reserve Bank of Dallas. The U.S. economy achieved a milestone in May with employment exceeding the all-time high in January 2008. 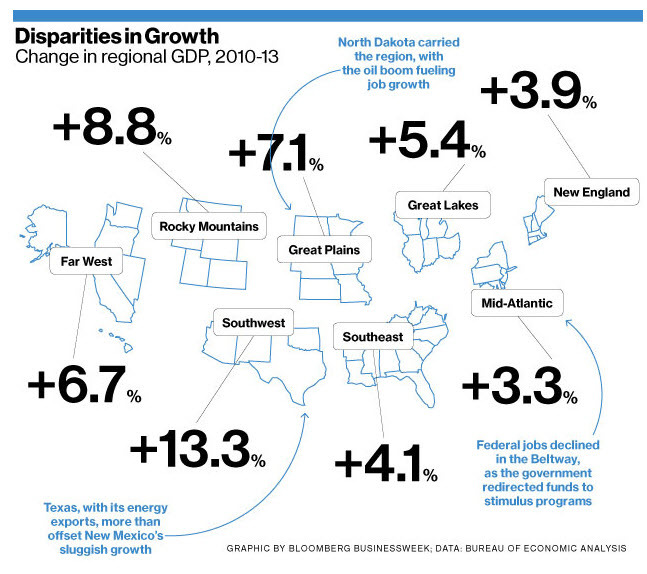 Yet 29 states have not recovered all the jobs they lost in the recession, according to U.S. Department of Labor data. The weakest employment rebound has been in the states worst hit by the bursting of the 2002-06 housing bubble. Arizona, Florida, and Nevada each remain more than 50,000 jobs short of the employment highs they logged from December 2007 to June 2009.